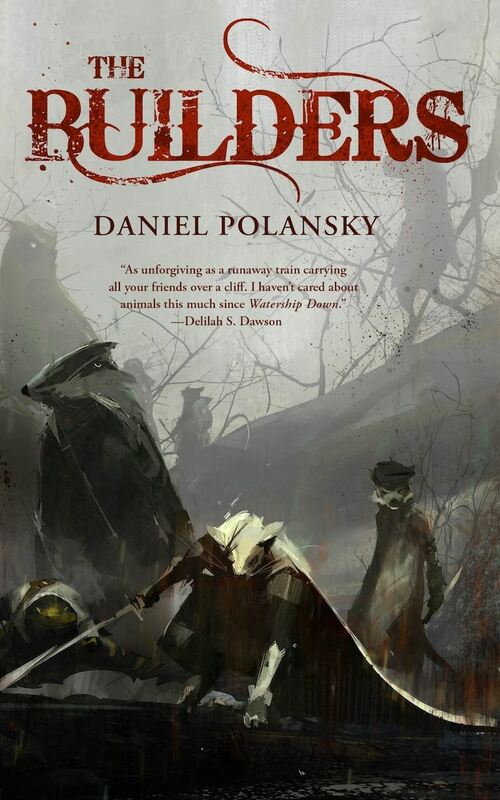 "The Builders," by Daniel Polansky [bio] (edited by Justin Landon), published on November 3, 2015 by Tor.com. Pro: Each character has his or her own arc that bends towards an individual destiny. Bonsoir, the completely amoral assassin, meets Puss, his counterpart, for mutual destruction through mutual deceit. Cinnabar, who is almost the pure essence of killing, meets his own counterpart, Brontë, for mutual destruction through sheer force. Elf meets Quaker, the lover who betrayed her. She alone welcomes death as an end to pain. Barley's fate is unknown, as befits one who didn't want to kill yet who killed the most of all. Boudica, who only killed those who deserved it, comes away scott-free. Gertrude dies hard. Even in retirement she was an agent of death. She's the only one whose killings ever cause the reader pain. "He hoped they wouldn't miss him too terribly." And the Captain--he's a force of nature. The scourge of God who burns everything away. The author uses a chatty, omniscient narrator to great effect. It gives the story a lot of the feel of an old-fashioned tale. There's not a false note anywhere in the narration or the dialogue. The ending, although a bit depressing, makes complete sense. The Captain is not a creature who builds things; he's a creature who breaks things. His story ends here, as it should. Finally, there's something consistently amusing about the choice of animal for each role. The worthless monarchs are toads, the incompetent chancellor who seized power through treachery is a skunk, the queen of the underworld is a mole, etc. Con: It's just as likely that Boudica's arc doesn't have an end simply because the author made a mistake. It's a little unsatisfying that when the Captain and Mephetic meet, the Captain doesn't kill him himself. And of all the aspects of the plan, letting the Captain be captured seemed both unsound and unnecessary. One very small discontinuity: at one point Puss is described as calico (even though all calico cats are female) but then later he's described as "the handsomest little white cat." My issue with this was that I felt it lacked a middle of any substance. There was an elaborate opening with each character dealt with individually, and an elaborate finale with again each character getting a spotlight, but the middle was a quick set of events designed to hustle the characters from the intro to the finale. I felt that novella length had been achieved by sacrificing any exploration of the premise. Admittedly that's focusing on a negative: the cast was great, the cinematic tone was achieved with style, the characters and their history were illustrated with great use of familiar tropes, etc. I just wonder what that middle would have consisted of. Certainly the pacing never felt rushed to me. I have read stories where the author just skipped a critical scene with something like "After the castle was secured . . . " but this wasn't like that. I rate it a 4, recommended. Your pro/con analysis is insightful and I agree with it. The main thing that bugged me was that the characters were animals, though I do recognize it's a nice shortcut to giving them traits and visuals very economically. :-) Still, the story was very well crafted, well plotted, exciting and a fun read. What struck me the most was the "cinematic" style of the writing. Some chapters were so short that they felt like cut-scenes in a movie such as flashbacks or "meanwhile..." panels in a graphic novel. This makes me wonder if the author writes this way all the time or if this story was an experiment.